Sorry, there are no shows on sale at The Fleece right now. The Fleece Bristol is the city's largest independent venue, and has gained almost legendary status through its club nights and live gigs - both of which cater to a variety of musical genres and tastes. Open seven nights a week and offering a late bar which runs until 4am, the Fleece Bristol promises a high-energy night to remember - whatever the event. 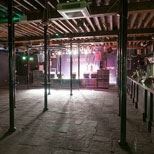 With its 450-person capacity, the Fleece Bristol is the perfect venue in which to catch promising local bands as well as major acts on the up-and-up. Indeed, chart toppers such as Coldplay, Muse, Amy Winehouse, The Killers and Oasis have all played Fleece Bristol gigs in the past. The closest train station is Bristol Temple Meads. There is wheelchair access. Please contact the venue for access information on 0117 945 0996. Please contact the venue for access information on 0117 945 0996.